There is a news article of possible interest in Medical Daily: Sugary Drinks Increase Bad Bacteria in Gut, Risk of Diabetes : Consumer News This article reports on a paper in Obesity Reviews. Alas the paper is not freely available. But the PhD thesis from one of the authors is. The thesis is fascinating – I have read much of it now and skimmed other parts and it has the article as Chapter 2. There are a few differences in the abstract – for example the Obesity Reviews paper does not start off with “The saying “you are what you eat” is no longer pure folklore but is scientifically substantiated by recognition of host-microbe interactions promoting digestion, absorption and metabolism.” which is in the thesis chapter. But my guess is the published article is very similar to the thesis chapter. Whew. It is a doozy. No evidence that the bacteria found are “bad” as far as I can tell. No evidence that sugary drinks specifically cause the increase. The paper is a review paper outlining a lot of prior work and some theories hypothesizing connections between fructose and sweeteners and the microbiome and obesity. But I don’t see any evidence of specific increases in bad bacteria in the gut. Byline: Sugary drinks help bad microbes grow in the human gut. This increase leads to many health complications like obesity and metabolic syndrome, raising risk of diseases associated with metabolic syndrome like diabetes. Wow. Even worse than the title. Sugary drinks help the bad microbes grow. And this leads to many health complications. No evidence is presented for this. In this case it is certainly much better to go to the source than to read the news story since the source (the PhD thesis and presumably the review paper) is quite thorough and interesting. It has some fascinating ideas about sugar and sugar substitutes and their potential effects. Mind you, I think microbes play a role in obesity too. But the simple “sugary drinks CAUSE growth of bad bacteria which CAUSES health problems” well, if only it were so. 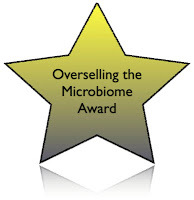 So for their overselling the effects of sugar and the microbiome without evidence I am giving the Medical Daily a highly coveted “overselling the microbiome award“. So, no evidence, no correlation, yet causation! Not for the first time(! ), but enough to be award winning. Call it a gut reaction.